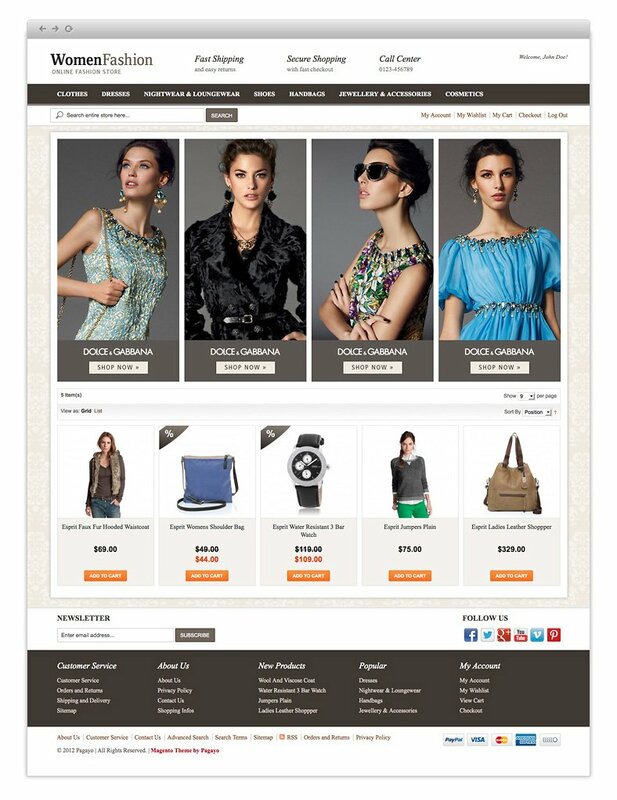 Women Fashion is a Magento Theme with a very elegant design. This Magento Template is perfect for any kind of fashion products. 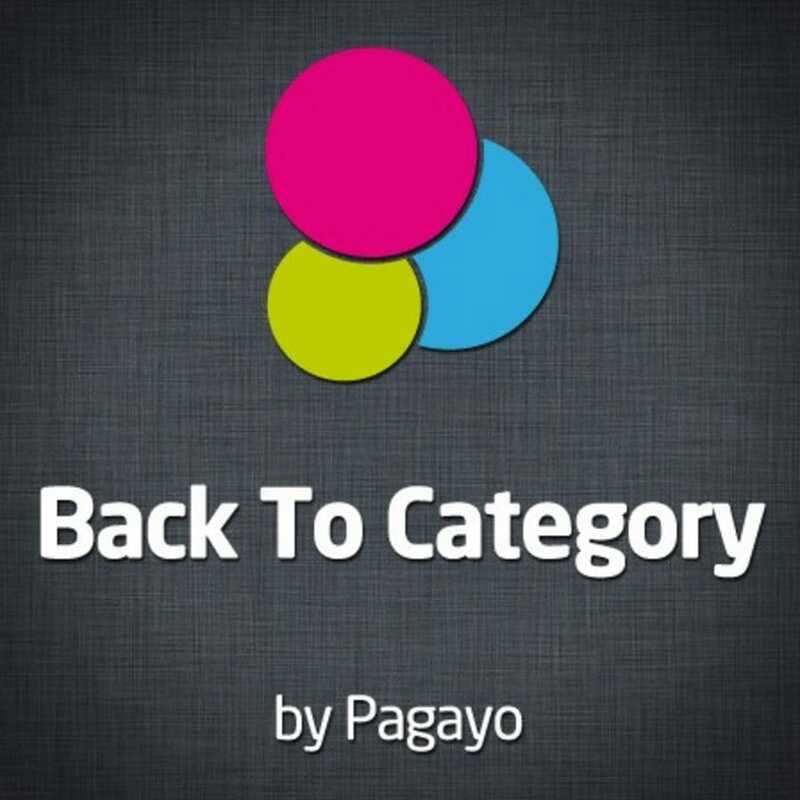 Pagayo has been active on Magento.com from 2007. We have 18.000+ downloads and 50+ reviews. You can read about us on Magento.com by clicking here. LIKE TO BUY THIS THEME? Women Fashion is a Magento Theme with a very elegant design. This Magento Template is perfect for any kind of fashion products. In this Magento Template, you can promote your products, categories or special campaigns in the sidebars of you store. Each sidebar block can be easily managed in the Magento backend CMS. Since the CMS accepts HTML, you can add text, links or images. The homepage contains a slider and 4 more promotion blocks. All images can be managed in the Magento backend CMS. You can also show a list of featured products at the bottom of you hompage. Just select a category that includes the products, you want to promote. Header and footer are highly customizable. All texts, links and images can be managed in the Magento CMS. The header section is perfect to show your most important USPs. The footer includes a newsletter subscription field and Social Media links. You can add links and payment icons. 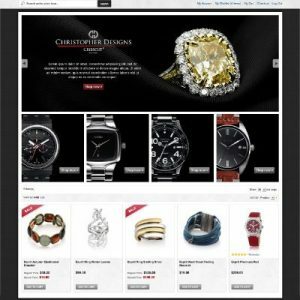 We want to achieve a professional webshop presence and the best possible user experience. For that we styled all Magento pages in the theme layout. Including useraccount pages, contacts page, shopping cart, checkout pages and more. The category pages are designed for grid and list view. Most users like the grid view to see everything at a glance. If you want to show a short description for each product we recommend the list view. 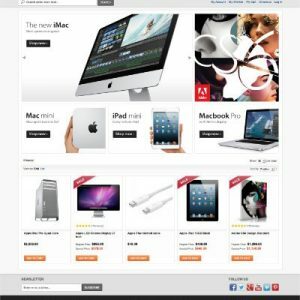 This theme includes an automatic Sale label for products with special prices. A clean overview is important for customer satisfaction and can increase your sales. The product pages in this theme have a slick design with a big product image and all important infos at a glance in the top section. It works perfect with upsells, related products and all kinds of product types. Multi sub design. When you buy this theme you will get all PT004 designs, like Electronics, Jewelry and Fashion. And more to come. Theme updates. The theme is updated weekly. New features are added. Customization. The theme can be customized to all your needs. Many changes can be done from the Admin Panel. RTL. If your language is RTL than you can use this theme. Multi Language. Do you want to use more than one language? No problem. Multi Shop. You can use this theme in as much shops as you like. The compare products page is a extra added page. MEGA MENU design. You can use it or not! You can add as many slides to the slider as you want. You can change all slides, images and text from the Admin Panel. If you do not like the homepage you can create a completely individual homepage. The featured products can be managed from a category in your admin. The brand carousel can be added or removed or replaced. And also these images can be changed from the Admin Panel. The new in store products appear automatically. You can update the SEO text to what ever you want. The footer can be updated from the Admin Panel 100%. Your own “All Rights Reserved” will be shown automatically. You can enable and disable the top bar. You can add or delete every detail you see in the top bar. You can change or disable the USP’s. Facebook login extension design. You can add as many buttons and icons to the menu as you like. The grid view has 3 different designs, it can be changed from the admin. The description is below the products. Sale banners will be added automatically.The contact page has it’s own design. You can easily add your own Google map. You can manage this page 100% from your admin. The checkout can be one page if you want. The footer can be updated from the Admin Panel 100%. Your own “All Rights Reserved” will be shown automatically.